As you can see, we had just moved in… moving boxes and weird electronics on the floor. But I had found my Halloween decorations, thank gawd! When we first moved in, I already had plans in place for this space- two opposing West Elm Henry sofas in dove gray, a pair of table to use as a coffee table in aqua (I had painted those while we were waiting to move in), and loads of gray, white, and more gray and white, and some aqua. I executed that plan, and to be honest I can’t even tell you what style I was going for…. a bit modern and comfortable, but also mostly bland and boring and flat. 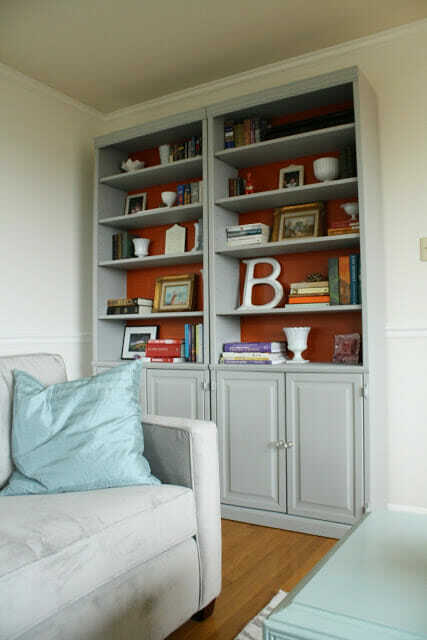 Well, it felt lifeless so I tried adding color and painted some bookcases in gray with orange backings. I brought in more color in a blogging challenge, and clearly my coffee table styling skills were spot on at this point. Oh, and I added a new rug, because the first new rug had a dog incident. It was also too small, so I found something larger with blue in it. I actually still really love this rug and found it on overstock for a good deal. After I added all of this color, do you know what happened? I began to twitch… I am NOT a bold color person. I am a neutral, earthy and blues person… what was I thinking??? This room has since gone through many transformations which have led to where it is today. I’ve gone through several coffee tables (3 besides those pictured that I can recall! ); painted the fireplace black; added a vintage sofa, industrial pipe built ins, blinds, and a new midcentury desk for Chris; moved the bookcases and then removed them; and added some modern art from minted; oh, and I changed the rugs again and layered two. I think the absolute key to making it feel right for me thought was adding in more natural elements and plants…. those items breathe life into a space! All of these changes have led to where we are today, I can honestly say that it won’t be changing much from here on out. I am sure I will tweak things, but I feel like it’s finally 100% me and it suits our family’s needs perfectly now. It now has the earthy neutrals and blues I adore and is a far cry from that first rendition. The color comes from the freshness of the plants, which I was afraid of before. I thought I was destined to kill them, but I have discovered that I am actually not bad at plant care. I’ve lost some little guys along the way, but all in all, I’ve got loads of survivors. As you can see, it’s taken me 5 years of trying different things to finally “get it right.” But after that time, we have a space our family can all relax in together. Putting this look together took me understanding what the key elements of my style were. Once I figured that out, the rest was history! I’ve created a collage of my style’s key elements for you below, and you can click on the icons to shop directly. Now head on over to House Full of Sunshine to see the evolution of Karen’s master bedroom! And if you want to feast your eyes on a load of amazing before & afters, here’s the entire list from the week. Enjoy! You just have the perfect mix going on right now and I loved seeing how it all started. Happy Friday my friend. thank you so much, julia! it was embarrassing to share those befores, but also really funny. and funny trumps embarrassment any day! Oh Cassie! 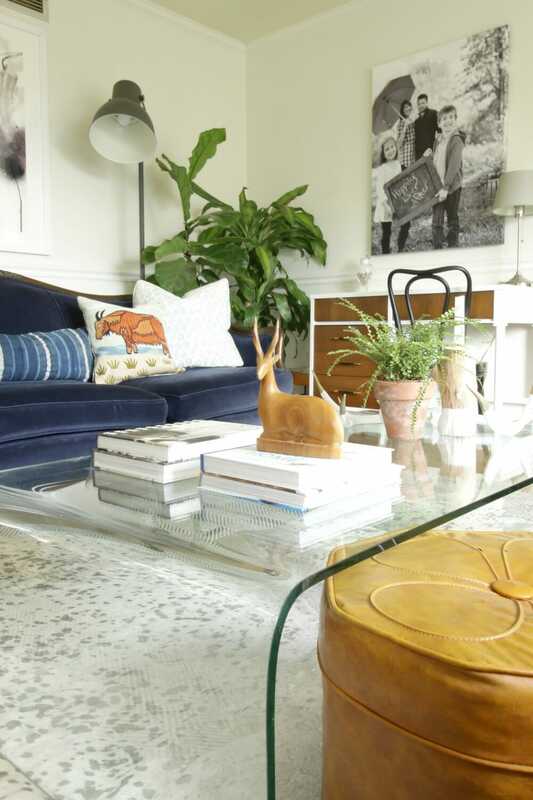 I love that early on coffee table styling:-)) We get better with age, right? It’s amazing how our style gets better and better over time. It took me forever to find my true style. Love your current situation very much, it reflects YOU! Have an awesome weekend! 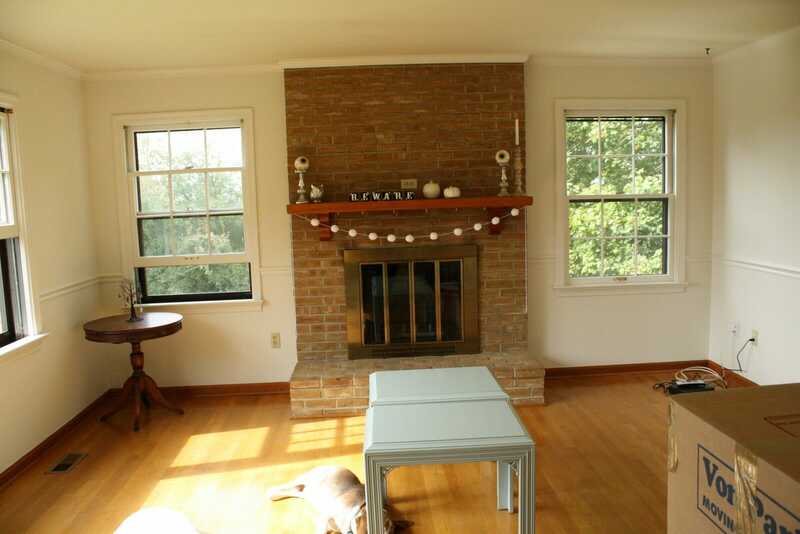 I love that your before pic has a “beware” sign on the mantel! I see your decorating manta was “when life hands you lemons, put them in a bowl on the coffee table”! Seriously – love your style and how you’re not afraid to take risks and try new things! oh it was so terrible before! but i think it’s fun to look back and have a good laugh at myself! Love your style and the transformation of your space!!! I love this Cassie! It’s so inspiring to see the way your style has evolved! I think your living room is absolute perfection now! oh i know, i think about that, too! i don’t think either of us will ever be minimalists either, but it really is interesting! i love vintage because it’s more unique and less store bought feeling and i think i always will. 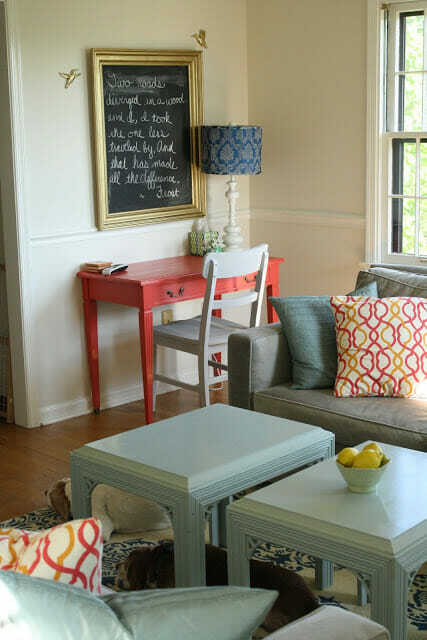 I love it, and I’m happy to know that I’m not the only person with an aversion to color in my home. I mean, I like it in small doses, but it wouldn’t sit well with me, just as you experienced. The room is gorgeous now, and I can see why you wouldn’t want to change it drastically anymore. I wouldn’t either, with those treasures! Happy to be a part of the hop with you! i know- i just can’t live with bold color! it’s not relaxing to me! I’m curious, have you ever done any posts about your outdoor spaces? I’m starting a redo of my back patio (stenciling the concrete with an ikat pattern today) and would love to see yours! Cassie, I did not know you started blogging back in 2009…yes, I clicked that button. I love what you have done with your space. It feels so cozy and very much earthy. I think the earthy feel and look of the space fits your personality an does your home good! I love it! Oh, and be careful. Never say never! Trust me. My home has gone through many transformations — and I think I’m ready for another one!!! You have one of my favorite living rooms ever! 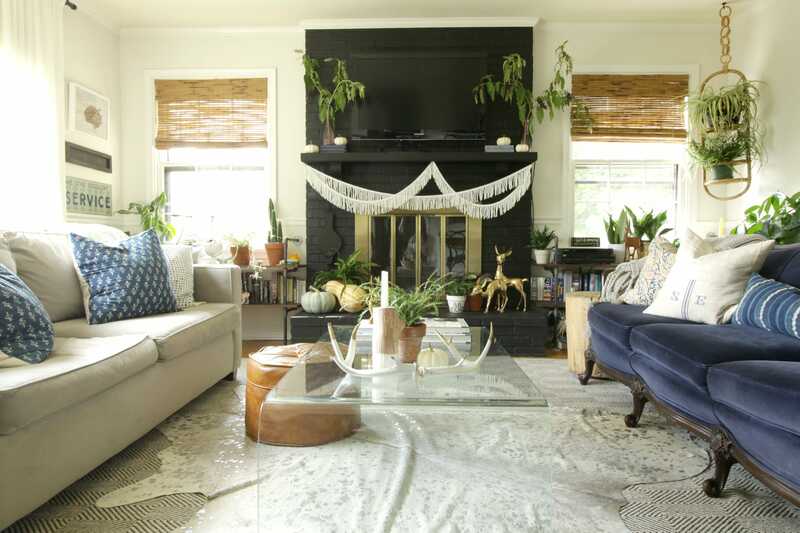 The blue velvet couch and all the plants are my favorite. thank you so much, catherine! i think it’s funny that i was so scared of plants before! i mean they pretty much let you know when they aren’t doing well…. how hard can it be, right? 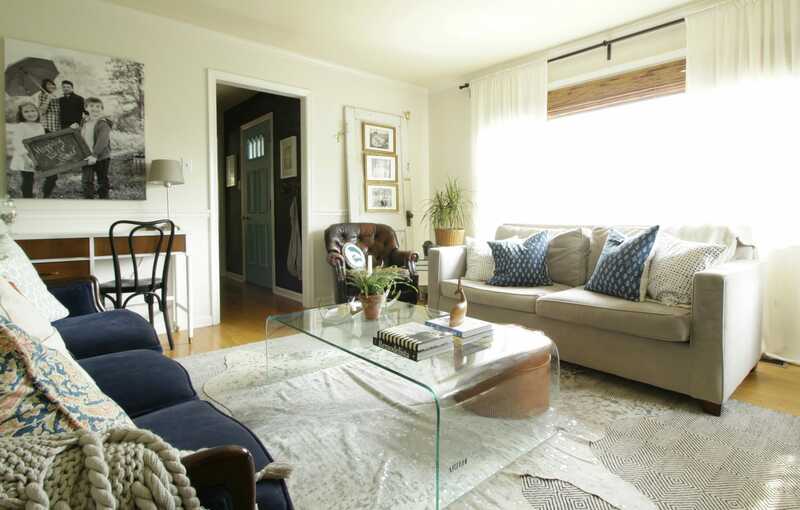 Love your living room so much–it’s such a cozy, awesome space! It’s a good thing I didn’t go with “vintage” as one of my words like I was thinking I would at first, or we would have matched 2/3 and that might have been a little weird ;). haha! i think we appreciate so many of the same things! It’s so cool that you have photos to document the whole evolution of the space! 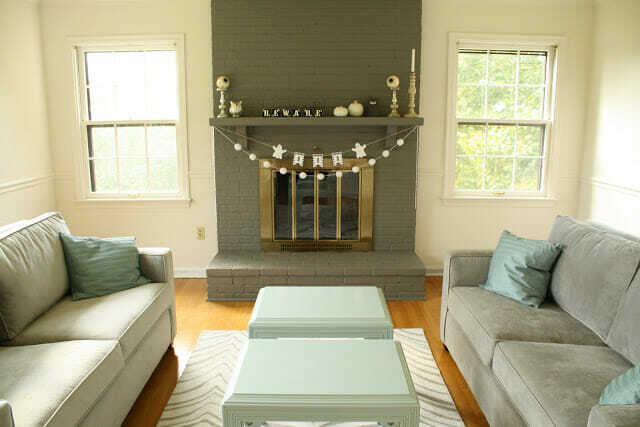 I’ve been dreaming of painting our brick fireplace black and seeing yours making me want to do it RIGHT NOW. So fun to see the evolution all in one place, Cassie! Looks like the perfect room for your fam now! I totally remember it from back then! I think we were doing the same color challenge at the time. I remember adding (unsuccessfully) hot pink to my dining room 😀 I shudder at the thought of it now. What a transformation this room has made! What I love so much about your style is how you bring in vintage pieces, but you keep it looking so fresh and new. Hats off, my friend. What a great mix! I love the plants and the hanging planter is awesome! Cassie, I LOVE how you define your style! And I also love how cozy and fun your home is! Great job with all the tweaking. It’s amazing!!! I love that your style features neutral colors (and I totally consider blue a neutral!) but it’s full of warmth and personality. So much fun seeing the transformations. thank you, kathy! blue is my neutral! Love this room and how you mix materials and finishes 🙂 That coffee table makes my heart sing! I’ve always wanted a lucite table! thank you! that table was a lucky auction find! it’s vintage glass and i got the nesting end tables, too! As always, great style, and such cohesion! haha- i had my priorities! it was scary 5 years ago! thank you, jessica! haha! the before was pretty funny!